The only effective form of treatment for a hernia is surgery. 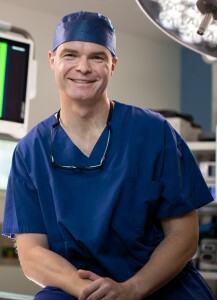 Depending on the type of hernia, surgery can be either laparoscopic or open. Both types of surgery are performed under general anaesthetic. In laparoscopic surgery, also known as keyhole surgery, surgical procedures are performed using fine instruments which are inserted into a series of small `1-1.5cm incisions in the body. A camera, known as a laparoscope, is also inserted into the body. The camera projects high-resolution imagery onto screens in the operating room. A mesh patch is then placed into the weak area in the abdominal wall using glue, absorbable screws or stitches. The mesh reinforces and decreases the tension on the weakened abdominal area. When compared with open surgery, laparoscopic surgery can result in less pain, less scarring, a shorter recovery time and less risk of complications. The most common types of hernias that can be operated on laparoscopically are inguinal, femoral, hiatus and incisional hernias. 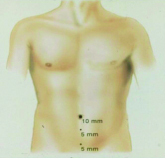 During open surgery for hernias, an incision over the bulge is made and the hernia is pushed back into the abdomen. 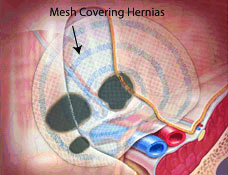 Similar to the key whole technique a mesh patch is then placed into the weak area in the abdominal wall using screws or stitches. The mesh reinforces and decreases the tension on the weakened abdominal area. 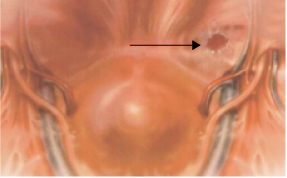 Umbilical hernias are usually treated with open hernia repair.